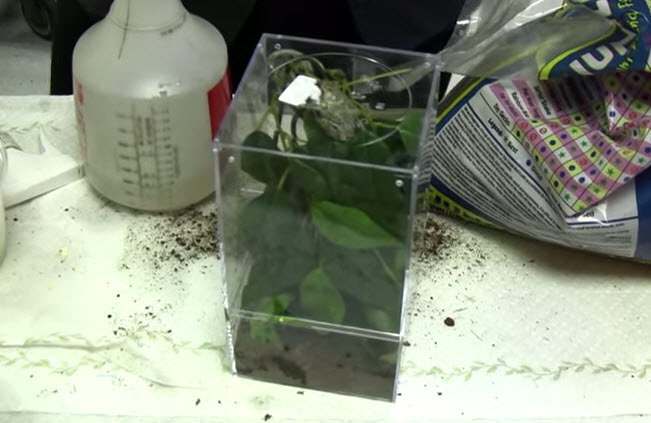 Make a miniature enclosure to hold your tree frog as needed! Get a clear plastic display container at a craft store. Drill small holes near each side of a corner of the enclosure lid for ventilation. Partially fill the enclosure base with substrate and moisten the substrate with dechlorinated water. Cut a piece of a leafy plant, attach a suction cup to the inside of the lid and hang the plant on the suction cup. Mist the plant with water, put your frog in the leaf section, and put the two parts of the container together.